So you want to raise money with custom t-shirts and logo wear. The traditional option is to create a bunch of order forms, hand them out, run around collecting them on the due date, and then tracking down the money and handling. You then add up the money, input all of the orders into a spreadsheet or email, and then send it off to the screen printer. All the while answering numerous questions, some you don’t know the answer too, and when all is said done, after all the work you put in, you wonder why you even bothered. You realize why you bothered because the end result outweighed the means and you push through until it’s over and every last person rececives their t-shirt. The pains of t-shirt fundraising. Talkingink introduces a better way. A way where your precious time remains your own and somebody else does all of the work and answers all of the questions. Imagine this. You find a company that will build you an online store, requires zero money to get started, they upload the products you want to sell. Answer any and all questions that people might have. The company will print and ship the orders directly to the consumers, and all you have to do in the end is collect a check for the funds raised. Sound like your life just got a bit easier? That is what Talkingink Custom T-shirts does. We make t-shirt fundraising a breeze for our customers. *Note: People are more prone to break out their credit card to make a purchase online than they are to dig up cash and submit a hand written order form. Talkingink works with people on their t-shirt and logo wear fundraising. We make it easy for you and your customers. Here is what we do. 6. We write you a check for the funds raised when the fundraising time period is over. We make t-shirt fundraising a breeze. It really is that simple. Here is a link to a demo fundraising store. Check it out, see how easy it is to navigate. Here is where you can contact us to inquire about your own t-shirt fundraiser. 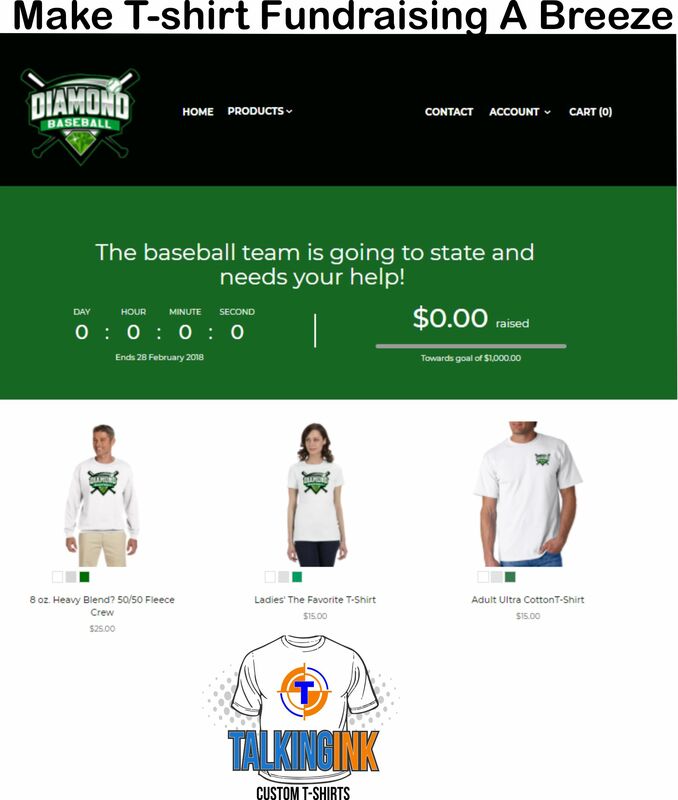 We carry a full line of apparel our we will work with our customers to help them make their t-shirt fundraising the most successful campaign it can be. We can provide you with best practices and the do’s and don’ts. Most importantly, your time remainds your time. We make it easy.